Providing Santa Clarita Valley residents with the opportunity to create their own glass pendent necklaces or earrings in a fun and welcoming environment with all of the supplies you could need to complete just the right piece for you Art Glass with Class seeks to bring their passion for glass work and handcrafted jewelry to as many people as possible. Making pieces of all colors and shapes is easy and fun with the instruction and supplies provided by Art Glass with Class allowing you to learn and spend time with your friends and family all while creating great lasting gifts or keepsakes. Whether you are looking to try out a new hobby or just want a fun way to spend the afternoon with friends and family, Art Glass with Class is the Santa Clarita Valley’s newest hands on arts and crafts location and one of the more unique. The process begins with a short 10-15 minute introduction where they will teach you some of the basics of assembling your own glass pendent then you will be left to create two pieces with all of the equipment and materials you will need. With each piece taking an average of 30 min to complete the typical experience is about an hour and a half long and costs just under $30. Your handmade pieces will then be available for pick up just seven days later after the Art Glass with Class crew completes some of the more advanced processes, leaving you with your own expertly crafted piece that is designed by you. The standard pendant and earring class is not the only service that Art Glass with Class provides since they also have a special project of the month which offers a unique class every month teaching participants how to create a special piece. Changing from month to month, monthly projects go on to represent any holidays or seasons, and were just recently teaching classes on how to create wire animals. 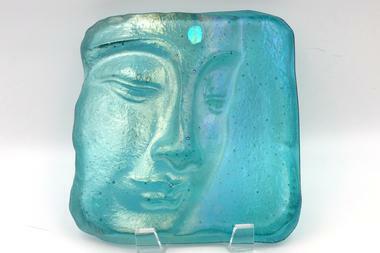 Art Glass with Class is a one of a kind glass fusing studio where you can walk in and create beautiful glass jewelry. They will give you a quick introduction on how to cut glass and design your very own glass piece.